Down in the Churchill War Rooms, part of the Imperial War Museum in London, a fifteen metre long interactive timeline invites the visitor to explore the life of Winston Churchill. An array of ceiling mounted projectors casts the pastel coloured visuals on a banquet-like table. The timeline is organised in tabs, which are marked with a year number and contain a list of the most important events. More eventful years, such as the period of World War II, are distributed across several tabs and marked with a range of months in addition to the year. When one enters the room, the earliest years of Churchill’s life are arranged on the right side of the table, from the back of the room towards the front, while the later years are organised on the left side, from the front to the back. No connection seems to be intended between the years that are opposite to each other on the table. The colours of the boxes as well as the half circles that appear on their top edges on the other hand seem to follow some coding scheme. To unfold the individual tabs, the user moves a yellow pointer to the desired year (portion) by sliding on a plastic touchpad below the projection. After a short delay, the tab opens and reveals another set of tabs corresponding to the selected months or days of the chosen time period. Again the pointer can be used to choose one of the sub tabs, which reveals — after a short delay — an artefact or an excerpt of Churchill’s biography. 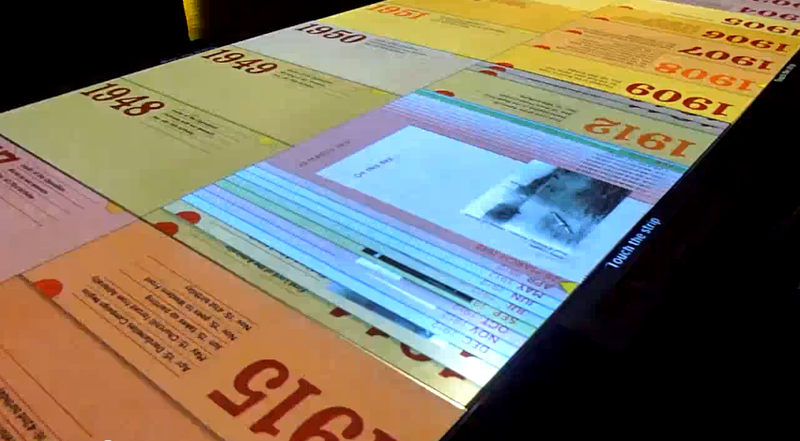 Several touch pads are mounted on the table, each giving access to a portion of the timeline. It is not possible to interact with the entire timeline at once, nor is it possible to have several tabs open. Despite the sleek appearence and the smoothly animated transitions, exploring the timeline is a cumbersome undertaking. Moving the pointer from one year to another often requires stroking the strip several time, and there is no other option to confirm the selection despite waiting for a few seconds and hoping for something to happen. When first trying out the Churchill War Room timeline, one tends to expect it to react directly on touch, when in fact it is controlled by the touch strip below it. In a sense, these shortcomings do not really matter, as most visitors (from observation) do not seem to understand how to interact with the timeline. One reason is, that the control strips are barely visible below the bright visualisation. The main problem however is not a fault of the design installation, but of the anticipations of the visitors. Primed by the technological developments of the past years, almost everyone (including the author) expects the timeline to react on touch. These expectations are assured, even after some visitors discovered the touch strip and managed to move the yellow arrow. After moving the pointer, nothing happens at first. Therefore, the user decides to touch the projection, at which point the tab opens — not triggered by the touch, but by the implemented delay. Yet for the user, it was the touch that caused it, which leads him to touch one of the sub tabs. Again, the tab opens. Although not necessarily the one that has been touched, because it was actually triggered by the delay and the current position of the yellow arrow. All of the visitors around at the time have been observed to be interacting in the way described. Some of them did show apparent confusion, or seemed to be aware of the fact that they were using the timeline incorrectly. To be fair, if the installation would be developed again, the designers would most probably implement the sort of interactions expected by the users today. Still, there’s no guarantee that tomorrow’s users won’t expect a completely different kind of interactions, maybe similar to the gestural interfaces developed by John Underkoffler and popularised by Spielberg’s Minority Report.